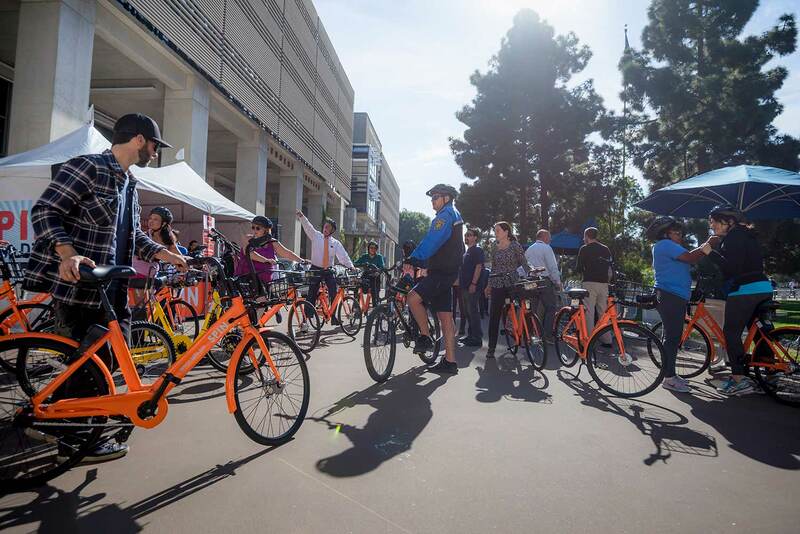 UC San Diego has launched a new bike-share program that could revolutionize how faculty, students and staff get around campus. 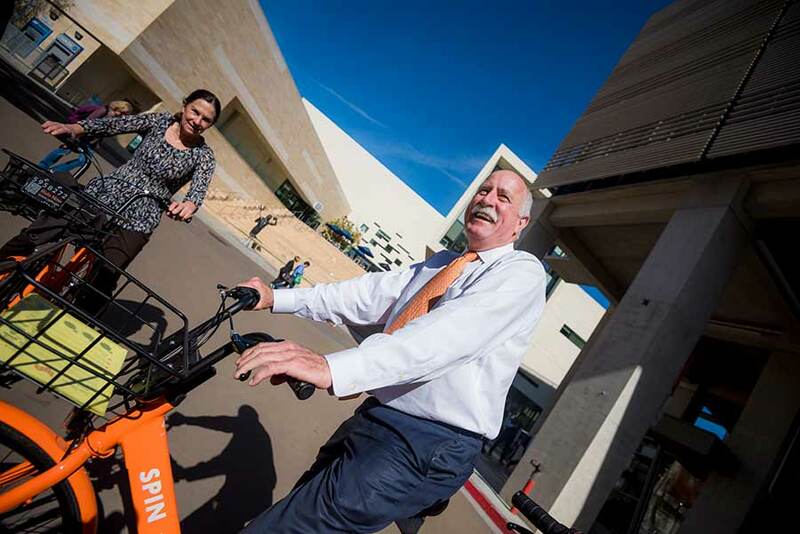 The initiative is a collaboration between UC San Diego and Spin, a leading bike-share company that offers a fleet of orange-colored smart-bikes. Each bike is equipped with a GPS tracking device that can be used to locate the bikes and, with the Spin app, unlocked by scanning its QR code. At the end of a ride, users simply park the bike in a responsible location, such as near a bike rack. Garry MacPherson, Associate Vice Chancellor of Environmental and Building Services gave the opening remarks at the Spin kickoff event Jan. 18. The Spin bike-share program had a soft launch in December with 50 bikes in key campus locations. An additional 250 bicycles were made available by the time of the Jan. 18 kickoff event. The bikes are meant for use on campus by students, faculty, staff and visitors. If a bike is taken off campus, it should be returned that same day. The program is a collaborative effort between transportation services, the sustainability program office and integrated procure-to-pay solutions. “With UC San Diego’s push to become a carbon-neutral campus by 2025, encouraging bicycle use through programs like this is key and there is already a lot of excitement on campus about the roll-out of this program,” said Dave Weil, director of campus sustainability and carbon neutrality. Weil added that he has been personally making use of the program, often using Spin bikes to get to meetings two or three times a day. In addition, student support has been critical to the initiative’s launch. 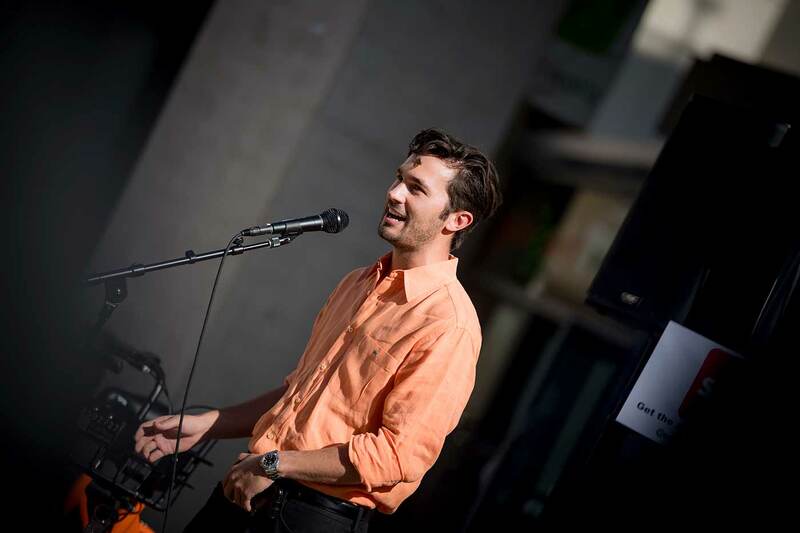 Mark Derdzinsk, President of the Graduate Student Association at UC San Diego. Lesly Figueroa, president of the UC San Diego Associated Students, echoed this enthusiasm. “We have been talking about getting people moving around campus with all the growth and we think this is a wonderful opportunity to address this issue,” she said. During the pilot phase, the campus will track bike usage and preferred parking areas in order to identify which campus locations will benefit the most from the service. Campus demand and use patterns will determine fleet and program area expansion opportunities, according to Curt Lutz, marketing manager for transportation services. Participants of the program are strongly encouraged to wear a helmet. Ian Happle, a bicycle enforcement officer at UC San Diego, has been biking to campus for years. Initially commuting from Pacific Beach, Happle now lives in South Park and takes a shuttle to Hillcrest where he bikes to the main campus and often bikes home to South Park at the end of the day. 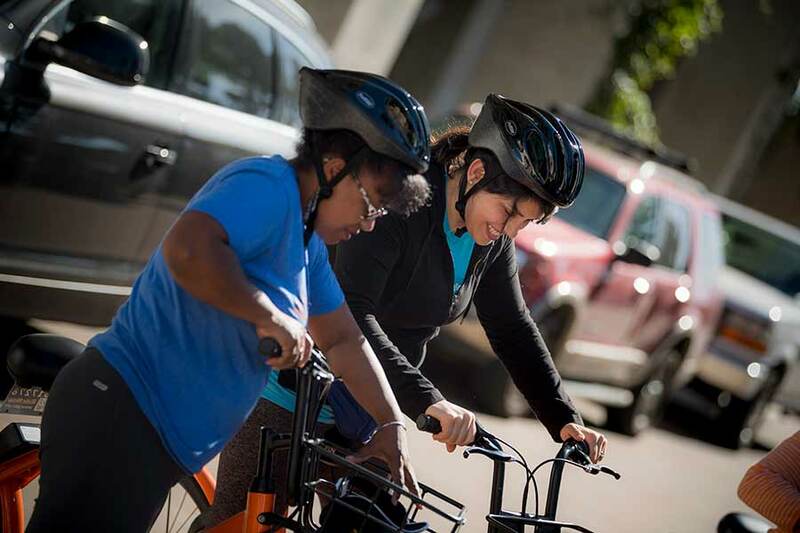 Users are responsible for providing their own helmet, however, Commute Solutions has a limited number of helmets available for riders to borrow. Commute Solutions also has coupons for $20 off a helmet at Campus Bike and Skate for UC San Diego affiliates, while supplies last. Riders under 18 years of age must wear bicycle helmets in accordance with state law. In addition, options are being developed to enable departments to pay for staff to use the bikes for commuting around campus. In order to access the bikes, students will need to download the Spin app from either the Apple Store or Google Play, register an account, and then scan the bike’s respective QR code.